Many children have multiple vulnerabilities. 47% of our pupils attract extra funding through the Pupil Premium Grant (PPG), as well as 53% who are entitled to the Early Years PPG. The government provides this additional funding to schools in order to help them to address the barriers to learning. It is for each school to decide how this money should be spent, in order to meet the specific needs of the children in the school. Due to the large percentage of pupils who attract additional funding at Mill Lane, in many cases we are focusing on enhancing provision to meet the needs of all children. In these cases, the Pupil Premium is used in proportionately. Resilience: a school-wide focus on developing a growth mindset, ensuring that our children learn how to overcome barriers for themselves. To be eligible for free school meals you must be in receipt of the appropriate benefits and have submitted an application for free school meals to the Local Authority Benefits Team (details of which are available from the school office). Pupil premium funding will be allocated following data analysis and pupil progress meetings which identify priority classes, groups or individuals. *Booster Reading \programme throughout school including Mid-day supervisor overtime to support 1:1 reading (BRP trained), and voluntary Right to Read Programme with Johnson Matthey, Youth for Christ and volunteer readers. Improved listening skills language and understanding. Children’s confidence in and enjoyment of reading increases. Children make good progress in reading. Children have opportunities to participate in a wide range of events and visits. Stability of key children, enabling them to attend, be ready to learn and be emotionally supported. Families have access to an identified adult who can advise them and help them access support from other agencies. Children’s emotional presentation improves so that they are ready for learning. · Tracks to Literacy Scheme introduced to EYFS and KS1. · Talk Boost intervention delivered by KS1 additional TA. TAs are reporting greater increase in confidence in pupils but cannot measure quantitatively at this point. · RWI books introduced into KS1. · New guided reading scheme introduced so that have access to more challenging resources. · New reading scheme purchased to promote enjoyment of reading at home. Right 2 Read, Youth 4 Christ, MDS. · RWI introduced to EYFS and KS1. · After testing Yr 1 pupils, phonics projections at 69%; Yr 2 re-check at 50%. · Introduction of Cracking Comprehension across school, with training. · All teaching staff have received Reciprocal reading training. · Year 2+ have access to the RWI spelling programme to ensure all spelling patterns are taught across school. Teachers more accountable for pupil’s progress and discussions re interventions and new strategies for pupils falling behind take place. · Talk Boost, Tracks to Literacy, 1:1 RWI phonics intervention carried out on pupils identified after pupil’s progress meetings or assessments. TA feedback to T effectiveness of these programmes. This is again monitored to ensure that chn are making grounds as a result of interventions during PPMeetings. 56% of our pupils attract extra funding through the Pupil Premium Grant (PPG), as well as 60% who are entitled to the Early Years PPG. The government provides this additional funding to schools in order to help them to address the barriers to learning. It is for each school to decide how this money should be spent, in order to meet the specific needs of the children in the school. Due to the large percentage of pupils who attract additional funding at Mill Lane, in many cases we are focusing on enhancing provision to meet the needs of all children. In these cases, the Pupil Premium is used in proportionately. The Pupil Premium grant is a government initiative of an additional allocation of funding designed for schools to address current inequalities and tackle disadvantage by supporting the attainment and progress of specific groups of children who are vulnerable to possible underachievement. The Government are not dictating how schools should spend this money, but are clear that schools will need to employ the strategies that they know will support their pupils to increase their attainment. Spring 1 English lead, KI (Phonics Lead) · After testing Yr 1 pupils, phonics projections at 69%; Yr 2 re-check at 50%. Use high quality information about pupils current capabilities to select the best next steps for teaching Moderate · Regular pupil progress meetings held after assessment week to monitor progress and discuss next steps for pupils who appear ‘stuck’ On-going HT Teachers more accountable for pupil’s progress and discussions re interventions and new strategies for pupils falling behind take place. Use high-quality structured interventions to help pupils who are struggling with their literacy Extensive · Talk Boost, Tracks to Literacy, 1:1 RWI phonics intervention carried out on pupils identified after pupil’s progress meetings or assessments. On-going TAs, Phonics lead TA feedback to T effectiveness of these programmes. This is again monitored to ensure that chn are making grounds as a result of interventions during PPMeetings. The Pupil Premium funding allocation was spent according to plan. There were no variations. Extra costs were covered by the school budget. NB When reading data please bear in mind that up to 21% in each cohort is made up of children accessing the Speech, Language and Communication provision from across the authority and this typically means a corresponding proportion unlikely to achieve at age-related standards. ‘National Other’ means non disadvantaged. At their first statutory assessment, there is clear evidence of low levels of development for many of our pupil premium children. Early Years pupils have been specifically targeted to reduce the barriers to learning and progress. 48% of Reception pupils are disadvantaged – 14 pupils (13 boys and 1 girl). This significant gender difference has impacted on the data as there is a large number of SEN disadvantaged boys (9) in this cohort and only 1 disadvantaged girl. 50% of disadvantaged pupils achieved the GLD. Nationally, 73% of non-disadvantaged pupils achieved the GLD. Therefore, there is an achievement gap of 23%. This has doubled from 2017 but is significantly less than the gap in 2016. Despite the low starting points and high number of disadvantaged pupils, 50% is just below disadvantaged pupils nationally (56%). The impact of our efforts to improve literacy skills is evident in the Y1 phonics results. 53% of pupils are disadvantaged – 16 pupils (8 boys and 8 girls). 81.3% of disadvantaged pupils achieved the standard which is just short when compared to 84% of ‘Other’ pupils nationally. Therefore, there is an achievement gap of just 2.7% which is less than one child. This has narrowed by 11%. National disadvantaged is 70%. The performance of disadvantaged pupils in school is 11% higher than disadvantaged pupils nationally. This has closed by 12%. 47% of pupils are Disadvantaged – 14 pupils (7 boys and 7 girls). 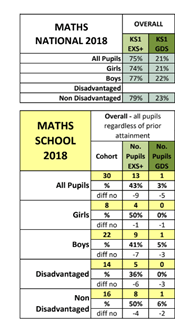 There is an extremely large number of SEN (43%) in this particular year group including 7 Y2 boys in the ARP which significantly impacts on data. 36% of disadvantaged pupils achieved the expected standard compared to 79% of ‘Other’ pupils Nationally. There is an achievement gap of 43%. This has widened by 17%. National disadvantaged is 54%. Disadvantaged pupils are below disadvantaged pupils nationally by 18%. This has widened by 8%. 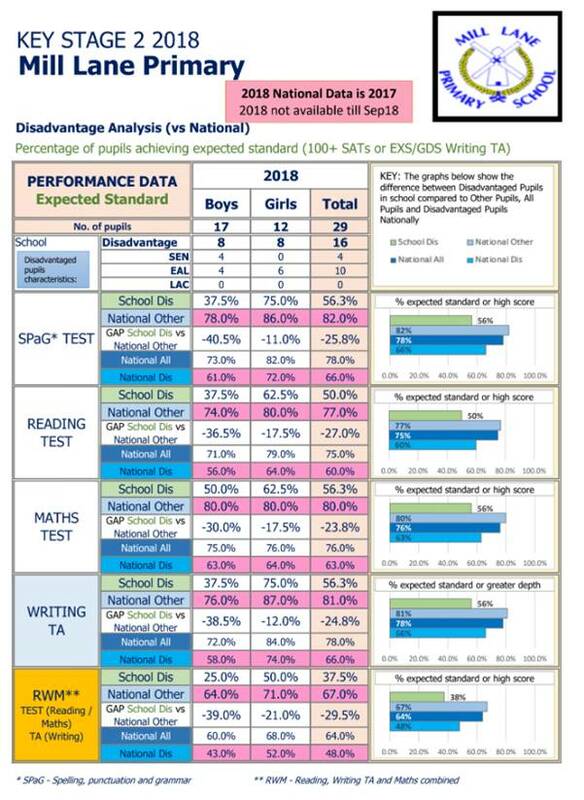 29% of disadvantaged pupils achieved the expected standard compared to 79% of ‘Other’ pupils Nationally. There is an achievement gap of 43%. This has widened by 30%. National disadvantaged is 60%. Disadvantaged pupils are below disadvantaged pupils nationally by 25%.. This has widened by 21%. 36% of disadvantaged pupils achieved the expected standard compared to 79% of ‘Other’ pupils Nationally. There is an achievement gap of 43%. This has widened by 23%. National disadvantaged is 62%. Disadvantaged pupils are below disadvantaged pupils nationally by 26%. This has widened by 23%. In reading the progress of pupil premium children and the progress of non-pupil premium children is exactly the same. The gap has closed by 10%. In writing the progress on non-disadvantaged pupils is still better than disadvantaged pupils. However, the gap has closed by 2%. In maths the progress on non-disadvantaged pupils is still better than disadvantaged pupils. The gap has widened by 16%. By the end of primary school the impact of pupil premium spending in Mill Lane is evident in the attainment and progress of pupil premium children. 55% of pupils are Disadvantaged – 16 pupils (8 boys and 8 girls). 50% of disadvantaged pupils achieved the expected standard compared to 77% of ‘Other’ pupils Nationally. There is an achievement gap of 27%. This has narrowed by 16%. National disadvantaged is 60%. Disadvantaged pupils are 10% below Disadvantaged pupils nationally. This has narrowed by 6%. 56% of disadvantaged pupils achieved the expected standard compared to 81% of ‘Other’ pupils Nationally. There is an achievement gap of 25%. This has narrowed by 25%. National disadvantaged is 66%. Disadvantaged pupils are 10% below Disadvantaged pupils nationally. This has widened by 7%. 56% of disadvantaged pupils achieved the expected standard compared to 80% of ‘Other’ pupils Nationally. There is an achievement gap of 24%. This has narrowed by 19%. National disadvantaged is 63%. Disadvantaged pupils are 7% below Disadvantaged pupils nationally. This has narrowed by 12%. 56% of disadvantaged pupils achieved the expected standard compared to 82% of ‘Other’ pupils Nationally. There is an achievement gap of 26%. This has widened by 7%. National disadvantaged is 66%. Disadvantaged pupils are 10% below Disadvantaged pupils nationally. This has widened by 7%. 38% of disadvantaged pupils achieved the expected standard compared to 81% of ‘Other’ pupils Nationally. There is an achievement gap of 43%. This has widened by 7%. National disadvantaged is 48%. Disadvantaged pupils are 10% below Disadvantaged pupils nationally. This has narrowed by 7%. In reading, pupil premium children have made more progress than non-pupil premium with a difference of 0.8. The gap has closed by 3.9. In writing, pupil premium children have made more progress than non-pupil premium with a difference of 0.4. The gap has closed by 5.8. In maths, pupil premium children have made more progress than non-pupil premium with a difference of 0.5. The gap has closed by 4.2. 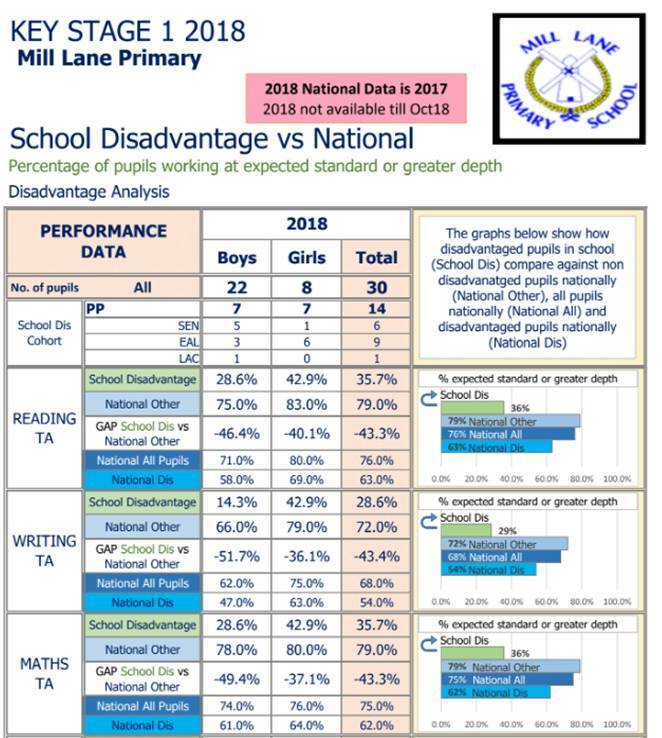 Levels of deprivation at Mill Lane are considerably higher than nationally and the proportion of pupil premium children is considerably higher than national figures. 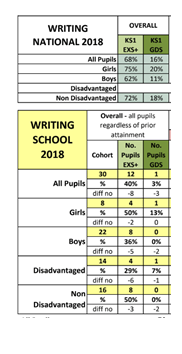 A significant number of other children live in families who are just above the threshold (working-poor) and a significant number of other children are refugees and are not eligible for pupil premium funding but are in the lowest 5% in the country for deprivation. When planning the budget, including pupil premium spending, we work extremely hard to ensure that the maximum number of pupils benefit from pupil premium funding and that no child is discriminated against. By the time children leave Mill Lane pupil premium children have caught up to non-pupil premium children and often overtaken them. Whilst the plan to target specific older pupils across school continues to work, the plan to put funding into targeting younger children for early intervention and rapid progress is also working and will continue next year. Removing/reducing the barriers earlier means that children are able to access the curriculum for their year group sooner and more effectively. Although the attainment of KS1 pupil premium children is lower than last year the progress this cohort have made from their low starting points is very pleasing. They have made good progress in reading, writing and maths. The gap is closing from last year in reading and in writing. It has widened in Maths. The school is now a Mastery Hub School and there is a real focus on the teaching of mastery in Y1. PiXL maths intervention is being used in year 2 and pupil premium pays for an additional TA for this to take place. In KS2 the gaps are narrowing against national average and national other. PiXL is being introduced across KS2 and pupil premium funding is used to employ additional staff to enable this to take place. Pupil premium children are making more progress than non-pupil premium children and the gaps have closed considerably. Needs analysis will continue to identify and prioritise individual children and Pupil Progress meetings will continue to monitor the progress of individual pupils and focus on removing the barriers to learning by effectively mapping provision. *Booster Reading \programme throughout school including Mid-day supervisor overtime to support 1:1 reading (BRP trained), Right to Read Programme with Johnson Matthey, Youth for Christ volunteer readers. Attendance data will improve from 94.9% last year to national average of 96% or better.